Our new research report on the global oligonucleotide synthesis market gives a brief overview of the global market. The report includes projections on the global oligonucleotide synthesis market revenue growth and the factors likely to impact this growth during the period of forecast. The report describes the scenario of the global as well as the regional markets. The other segmentations of the market are on the basis of service type, application and end users. The taxonomy bifurcates the market into simpler parts and thus helps in easier understanding and study of the market. The report includes individual analysis of every segment, thereby helping the reader understand the global oligonucleotide synthesis market from a broader perspective. An important part of our report is the analysis and recommendations on the global oligonucleotide synthesis market. The report takes an overview of the global oligonucleotide synthesis market and also underlines factors influencing the growth of the global oligonucleotide synthesis market. Our analysts have also provided key strategic recommendations for both existing and new players in the market to emerge sustainably profitable. The report covers the competitive landscape that provides a dashboard view of companies that manufacture and provide services in the global oligonucleotide synthesis market. The report further includes company profiles of some of the key market players and a strategic overview of mergers and acquisitions along with companies’ expansion plans across regions. Apart from including these factors, the team of expert analysts have also taken into consideration the various macro-economic indicators such as market outlook, gross domestic product and other pointers to arrive at the indicated market numbers. Top-down approach has been used to counter-validate the reached numbers in the global oligonucleotide synthesis market, while bottom-up approach has been used to assess the market. Weighted average selling price is considered to estimate the market size mentioned in the scope of the study. The country price is captured with the local currency. The local currency figures are then converted to USD to offer forecasts in a consistent currency standard. Furthermore, this market research company has also considered the latest annual exchange rate to reflect the impact of the most recent economic conditions of country. Our research methodology uses both primary and secondary research to collect the relevant data. We have analyzed the market by considering revenue through extensive primary research to understand usage patterns, historic trends, key market developments, and most preferred products. Key opinion leaders have been considered for primary research and these include experienced professionals in various healthcare and pharmaceutical companies. These estimates are further validated after extensive interviews with product manufacturers, distributors, and suppliers. In-depth secondary research has been carried out to understand the service rate, adoption rate, regulatory scenarios, average selling price, and reimbursement scenario by referring to published scientific literature from various databases. We have also analyzed various companies’ annual reports, investor presentations and press releases to fetch substantial information about the market size, trends, opportunities, drivers, and restraints. Oligonucleotides are short fragments of nucleic acids that are synthesized using genetic engineering and enzyme chemistry. These are mostly used in laboratories in applications such as therapeutic, diagnostics as well as academic and industrial. These are used from initial research and screening through to target validation and drug production. Oligonucleotides synthesis occurs either commercially to provide services for various end users or individually via DNA synthesizers for self-consumption. Nowadays, subsequent improvements in oligonucleotide synthesis, amplification and automation has completely revolutionized biological research. It is also possible to do the customizations and get the required sequence online easily and at the required time. These services vary greatly by the cost of per base pair, error rates, lengths, throughput, etc. According to the market analysis, the custom oligonucleotide synthesis market is expected to lead with a higher market share than the universal oligonucleotide synthesis segment. The custom oligonucleotide segment is anticipated to reach a market size of over US$ 540 Mn by the end of 2025, growing at a CAGR of 8.6%. Whereas, the universal oligonucleotide synthesis segment is expected to expand at a CAGR of 7.8% during the forecast period 2017-2025. Looking at the growth prospects of the market, companies are focusing on improving their services via technology improvisations for high throughput synthesis with cost control in order to get more attention and gain maximum market share. Custom oligonucleotide synthesis is growing popular worldwide. With the increasing pace of research and development for novel products in the synthetic biology segment, there is an increasing requirement for high end customized oligos. An increase in the application of synthetic oligonucleotides in the industry and in academic research labs has resulted in an increase in demand for quality improvisations to remove impurities and increase its effectiveness. However, the costs of purification account for around 50% of the total production cost and continuous research is currently ongoing to identify upgraded methods to achieve desired results – such as the introduction of non-chromatographic methods of purification and many in-house developed modifications. The current market scenario involves established players in both the equipment and services market with strong brand recognition and expanded distribution channels. The systematic distribution channels active in the global oligonucleotide synthesis market have helped the market continue on an upward growth trajectory. A new trend reveals that in-house development of oligonucleotide affects sales from service providers. This in-house development is mainly carried out by academic and research institutes. Biopharmaceutical companies have also started developing oligonucleotides themselves or have provided the contract to other organizations in order to maintain confidentiality and ease of manufacturing. Limited requirements and cost constraints however cannot be tracked and thus tend to narrow down the market scope. The global market may also face a restriction in its growth due to the lack of available resources. 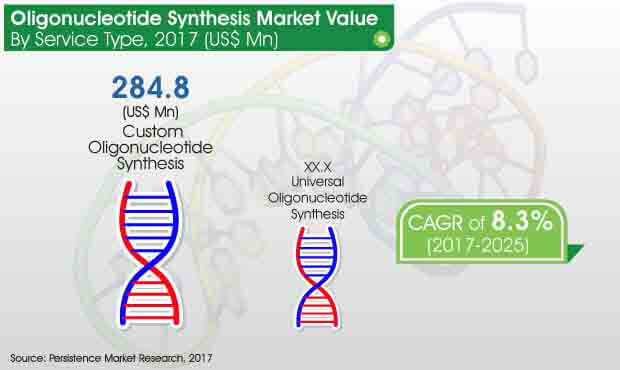 The global oligonucleotide synthesis market is expected to witness limitations in the availability of funding for research in academic laboratories, which may restrict market revenue growth. Along with this, there are also a limited number of market players existing in some regions and a shortage of skilled personnel. These factors may hamper the growth of research activities.